I set up all three shots on a tripod and shot with a Canon 5D Mark III DSLR and a Canon 24mm tilt/shift lens. To get the light streaks in the first image below, I exposed the frame for 2 seconds at f/8.0 with ISO 100. 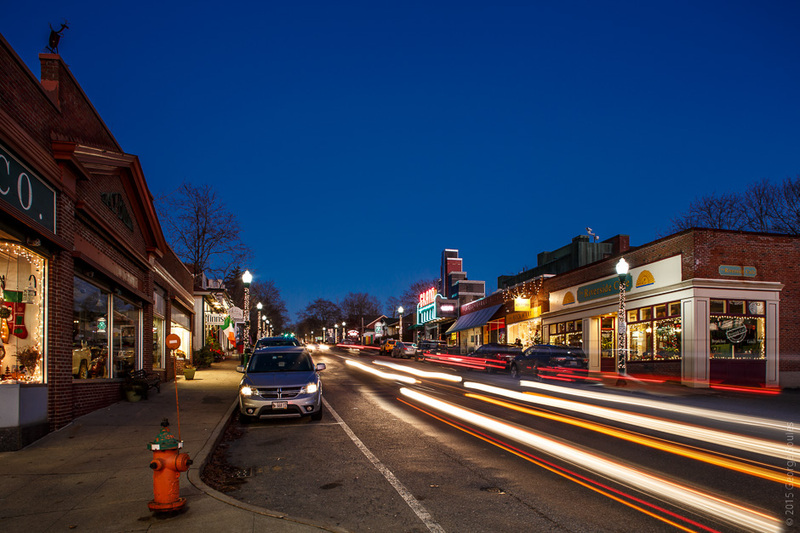 Standing on the street corner for about 20 minutes, I waited for cars to travel in both directions to get head and tail lights in the exposure. I took several shots and later in Photoshop combined three to create the final composite image. 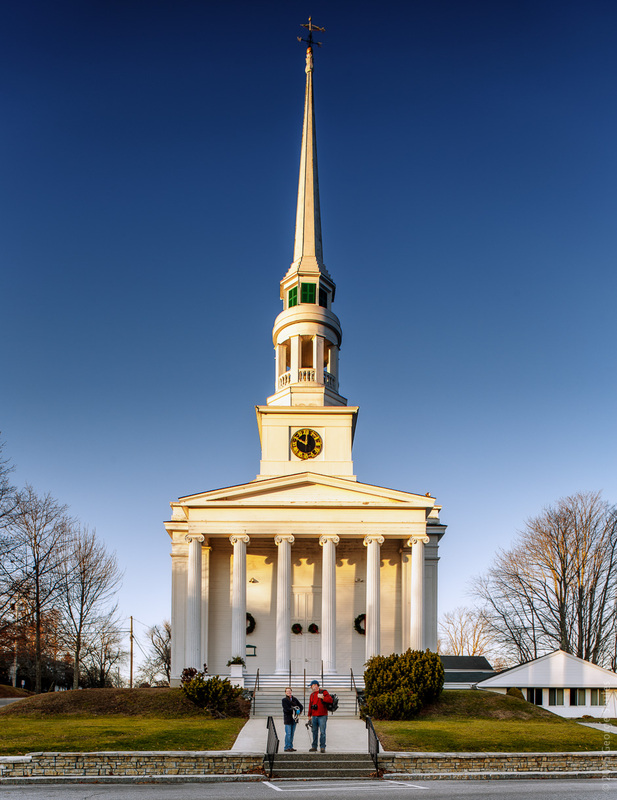 For the Ellsworth Congregational Church, I shot two frames at f/8.0 and ISO 100, one exposed at 1/80th second for the sunlight in the upper part of the frame, and another at 1/20th second for my friends Donna and Steve in shade at the bottom. I manually combined the two exposures in Photoshop. Note that because I shot this tall structure with a wide angle tilt/shift lens, I was able to capture the perspective correctly in-camera and eliminate the need to do any pixel mashing corrections during post-processing. 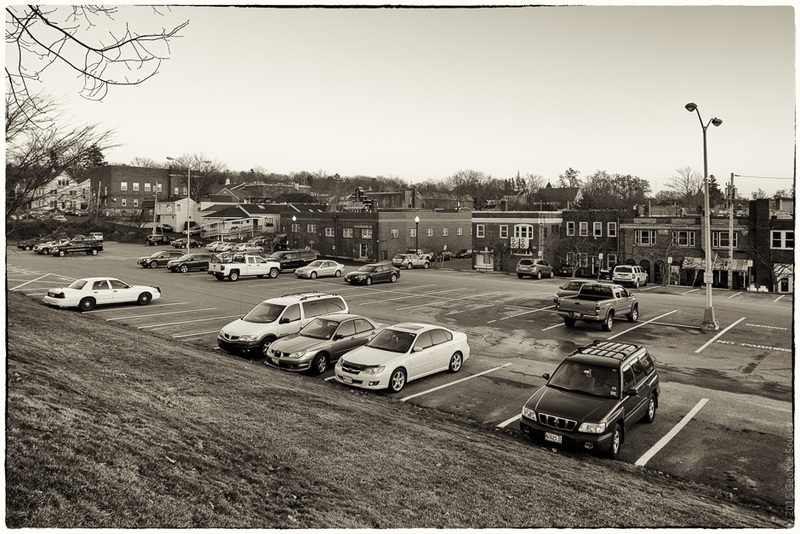 The third image, while not as dramatic as the first two, accurately captures the large parking area between City Hall (located to the left out of the frame) and the back of the buildings on Main Street. This photo will be much more interesting in 50 or 100 years because it so clearly shows today's modern automobiles against a backdrop of historic buildings. I wonder how this scene will look a century from now.